I meet people daily—teachers, lawyers, moms, college students, web developers—who want to be writers. They don’t want to quit what they’re doing, necessarily. They just feel in their gut they have something to say. I also work with people on a daily basis who are writers. They’re usually teachers or lawyers or moms or college students too, but they’re also bloggers or aspiring authors or storytellers and they reach out to me because they need a writing coach. I tell them that’s a great place to start. But you know what really gets me about working with these writers? And you know what I tell them? I say: great questions. Those questions are an excellent place to start. In fact, I suggest we actually answer those questions. Like, let’s put them down on paper and see if we can answer them for ourselves. What is the point of writing when I’m not sure if anyone will read it? Why should I do this when there are a million writers out there who are better than me? What does make me unique? And after years of making myself ask and answer these questions—and making hundreds of other writers do it, too—this is what I’ve come to. The point of writing when I’m not sure anyone else will read it is that it changes me. It really doesn’t matter if anyone else ever reads it, or if it becomes a New York Times Bestseller or if an agent picks me up or I get a publisher and make a million dollars and get to quit my job. I mean, sure, all of that would be nice, but it isn’t the purpose of writing. It isn’t the reason we do it—is it? And of course there are writers out there who are better at writing than I am. The same is true for writing. Writing doesn’t have to be about growing a following or building a platform or getting a million people to read your work. It doesn’t have to be about growing your career. It can be, and if it is, you have to start where everyone starts—right where you are. But it doesn’t have to be about any of that. Writing can be about becoming yourself. In fact, I’m finding, when I make it about this—about becoming myself, rather than becoming famous—I’m much happier and more productive in the end. And, as a happy benefit, when I write for the right reasons, the audience tends to to follow. And finally—the answer to the third question. What makes me unique is I am me. No one else in the whole world is like me. No one else has my temperament, my intellect, my experiences. No one else talks exactly like me, or has my same quirks. No one else spaces their hangers perfectly apart in their closet or listens to the same song on repeat 100 times while working on a project (yes, I do that. Don’t judge). I’m perfectly my own person, perfectly valuable, perfectly me. Saying, “my voice doesn’t matter” is like saying, “I don’t matter,” and although I’m certain at times we each believe that is true, it feels like a tragedy. But what if we changed our motives for writing? What if it wasn’t about becoming famous or selling a bunch of copies? What if it was just about becoming ourselves? If that were the case, I have a feeling our motivation would drive us to write—even on days when it didn’t feel like anyone was reading, or days we worried no one would ever read. I have a feeling it would help us trust the process and lean in and stay true to our voices and our message—no matter the audience. When we can do this, it’s almost like magic. Our writing improves. Our audience grows (slowly, but surely). We become more wholehearted, well-rounded people. Our healing becomes healing for others. If you’re interested in growing a huge audience or selling a bunch of copies or becoming famous, I’m not sure I can help you. But if you’re interested in this—in learning what it looks like to see yourself, to listen to yourself, to know yourself and to show up on the page, I have really good news for you. 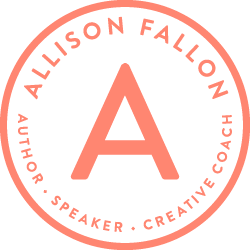 I created a course for you—and for anyone who wants to become a better writer. Grow in your satisfaction by teaching you how to connect with an audience in an authentic way. Whether you’re a mom, a college student, a teacher or a lawyer who wants to write but has been too afraid to start, or you’re already writing but aren’t sure about your next step, I challenge you to join me in this four-week journey to discovering your unique voice. Thanks Jeff, I took a course that you offered for free about eight months ago. I love your style and you put your true heart into your work. I would love to take your class. You are an amazing writer. The tone of my writing needs to be adjusted for an audience that I serve! Thank You. Thank you Lori! So glad you’re interested in the course. I’d love to have you join us. You can register at — http://yourwritingvoice.com. Yay for writing for writing sake! I have no audience, no book deal, and no millions. But I’m writing every day because it makes me happy, it makes my life better and, gulp, it helps me “become myself” as you so wonderfully state. I’m writing and I’m happier, smarter, and a better writer. All just through writing. Imagine the possibilities! Oh wait, I’m already achieving them! Hmm, now what? Book deal, a following, millions? As you say, those aren’t bad, but I don’t need them. Maybe they’ll come, that would be nice. In the meantime, thanks for your post reassuring me that I’m “doing the right thing” by just writing. Every. Day. That’s awesome, Bradley! Isn’t it amazing the freedom and joy that comes when we let go of the external motivators and embrace the internal ones? Don’t get me wrong, I started out shooting for millions (dollars, followers, etc.) but just stopped caring about “them” and started caring more about “me.” Then it all just flowed. BTW, in case you couldn’t tell, I’m your newest fan and love what you’re doing here! “Becoming myself….like magic.” Yep – that’s it, and me liking that little magic show? The best!!!!!! Wonderful! Thanks for sharing, Marcy. I recently started blogging more regularly and I find it rejuvenating. It pushes me to think about who I am, what I stand for and it even makes me think about my thinking 😉 For so long I kept myself so busy, I did not have time to explore my own ideas and issues. So I think the first one to benefit from my writing is me. JF — I can totally relate to that! Writing definitely helps us to slow down, listen to ourselves and become the best version of us. Glad to hear you’re finally taking that time to think. Allison, I am new to your blog and just wanted to pop in and say your writing is wonderful, encouraging, and honest. Thank you for sharing your gift and for being true to yourself through writing. Very inspiring! Thank you Katie! I’m so glad about that. I’m really thankful you’re here and hope you find what you need. Thanks for speaking up. Congratulations on starting your writing course, the puppy, and all the other amazing things happening for you! Brilliant post. I recently joined a writing group and never have I loved the gift of writing as much as I do. Being surrounded by like-minded people who simply delight in the joy of creating beautiful art is such a gift of grace. We’re not talking about building audiences and all that jazz. We’re discussing ways to be your best self through the craft. It’s refreshing. Also, I listen to songs on repeat obsessively. No judgement here! Shakirah — ooh, writing groups are the best! So glad you’re finding a rhythm with a good one. Good for you. So glad I’m not the only one who listens to songs obsessively! Bookmarking this post for every time I feel insecure about writing…Wish I could afford the time/money for your course right now. Your writing always seems to mold my mind and force me to see life and writing with a different perspective. It’s always good to be reminded that I’m worth something as a writer. We all have something to offer. Even for those of us who DO care a lot about being read widely and becoming “successful” in the worldly sense, NONE of that happens until you find and value your voice, and learn to enjoy writing as a personal growth experience. What you teach in your course is essential regardless of writer’s personal ambitions. I just discovered your blog today, through an RT of this post on Twitter (I’m sorry I can’t remember who retweeted you!). I love your writing, and I’ve subscribed to your feed. Writers write. Period. We don’t write for recognition, or money, or even to be read. Those are great goals, but they’re not enough to keep our butts in our chairs and our fingers on the keys day after day when they’re not coming. We write because we have to, because the words are there and they need somewhere to go. And because, as you said, the act of writing fulfills us. The work itself is the reward. I post a link on my blog every Wednesday. If you don’t mind, I’d like to link this post for the 24th of September. Thanks for sharing your thoughts! If that is possible then get your multi-room DVR from your operator for cash. the things they say buy it.